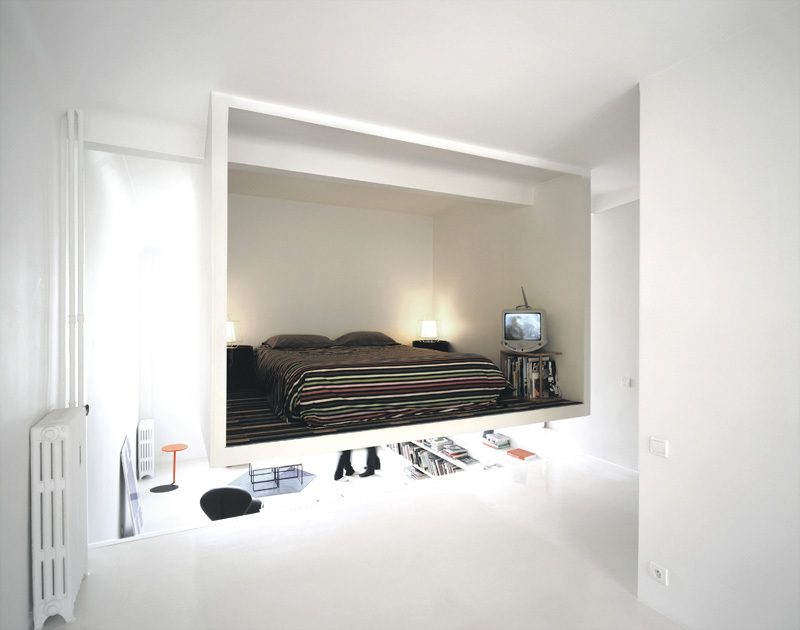 This tiny 50 square meter apartment in Montrouge, France takes the idea of the suspended bedroom and makes it even better. In this home, the floating loft bedroom doubles as furniture on one level and a cozy little cubbyhole on the other. Emmanuel Combarel Dominique Marrec Architects placed a suspended metal loft cube in the middle of the apartment between the kitchen/dining area and the sunken living room. This cube is a self-contained bedroom which takes up exactly zero of the apartment’s meager floor space. When the residents of the Apartment Chez Valentin have guests for dinner or just need more seating, the ledge of the bedroom cube is low enough for people to sit on like a bench. In the living room below, the overhanging suspended bedroom and the twin staircases create a kind of comfy nook in which to do some reading, watching TV or snuggling. Contrasting with the clean white of the apartment’s surfaces, the bedroom is a bright and stylish place. 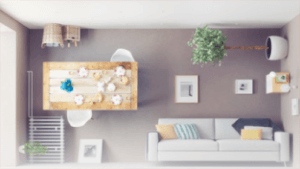 Looking into it is just like looking into any other apartment bedroom other than the lack of a door – and the fact that it is simply hanging out in the midst of the tiny apartment, providing a smart and comfortable space without compromising the already-small amount of room available in the home.